1986: Projects 034 and 637, mere blackmail tools? First, a few comments... Although this chapter fits chronologically into the time frame of this series of stories, it is nevertheless the last one to be added to the series. All other chapters were first published either in 2012 or 2013, this one follows more than five years after the previous last addition. This story was made possible thanks to Arjan de Roos and Brad Edwards who provided assistance with the research for this subject. I also express my sincere thanks to John Darlington and Brad Edwards of First Turn Productions for supplying the much welcome photographs taken at the Speedway. In order to respect the copyrights of the rightful owners, I generally do not include photographs of unknown heritage and with unknown copyrights. This time however, I have included one, a low-resolution scan of a picture of unknown heritage since it adds so much to the entire piece. Further information about this picture is welcomed in order to provide proper copyright details or removal from the site should this be required. This part of the Ferrari-at-Indianapolis series could be described as a lot of words about effectively nothing. It could be discarded as a rumour with little substance to boost. But what if we apply a strategy that has been used in this series of articles a few times already? Which is take things seriously and have an in-depth detailed look at what we have and what is known to us - then what do we end up with? It eventually didn't result in a piece of hardware but it's still a story and a bunch of facts of which there is a lot to tell and write about. And that is why this article deserves to be added to 8W's Ferrari-at-Indianapolis series. After the plans that never materialized for which Uncle Franco visited Indy to be inspired Ferrari stopped having Indy on its mind and instead focused on F1. Even F1's single distraction - the sports cars - were sacrificed in the process. But to say that Indy-wise nothing happened in the 70s? It wasn't that much at all but it could have been very different, and in a way that sounds too wild to be true. Cicada Racing was a small team that had built a few racing cars in the early 60s, and Murphy was one of its team principals. It is believed that the team, located in Plymouth, WI, built some five Formula Ford cars and one Indycar, all named Cicada. 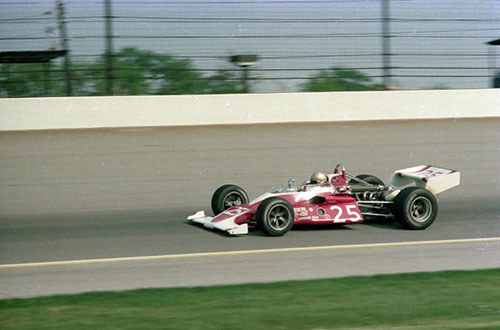 The Indycar vaguely resembled the 1972 Parnelli cars and mid-70s Brabham F1 cars with their pyramid-inspired shape of the monocoque and bodywork. 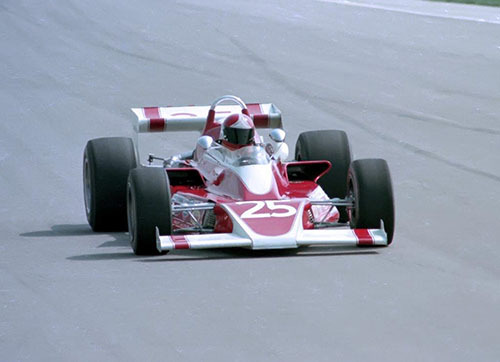 OldRacingCars.com lists the Cicada as a first-time entry at Indy in 1972, an Offy-powered machine entered by Agajanian/Leader Cards. 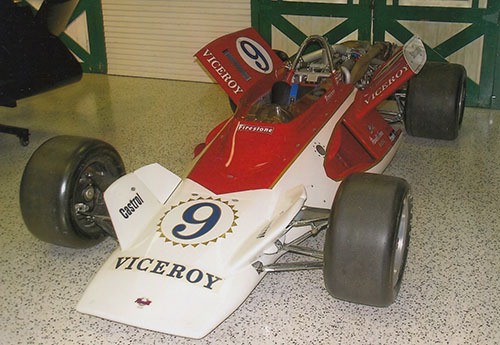 The car was driven by Mike Mosley but failed to qualify. Mosley qualified an heavily modified '68 Eagle-Offy instead. The Cicada wasn't entered at Indy in '73 but it is listed as having raced later on in the season. In 1974 the car had received new bodywork in front of the front axle resembling that of the '72-type Eagle Mk7. Entered as the #24 Adams Automotive it was driven by Leon Duray Sirois. Now that name may not sound too familiar, even though the name Sirois may ring a little bell. Yes, we are indeed dealing with the Leon Duray Sirois who became better known as 'Jigger' Sirois. And now we’re entering the corner of legends once again: time for a sidestep. 'Jigger' Sirois is likely to be one of the two drivers having become famous for never making it into the 500 after several attempts and heartbreaking experiences, Ralph Liguori being the other one. Jigger's fame at Indy is as the man who could have been the 1969 pole winner and the first rookie to do so in a long time. Weather was bad on Pole Day in '69 and eventually Jigger was the first man out to make an attempt. His team, however, deemed his average speed after three laps too slow and waived off the attempt. As rain made all other qualifying attempts impossible the rules at Indy would have made Jigger the pole-sitter for the race, had he finished his attempt and had the speed been fast enough to be among the 33 fastest qualifiers. Even if he had been the slowest of the 33 he would still have started the race from the prestigious pole position! Once qualifying was over, Jigger's two remaining attempts were not good enough to get him into the field. The saddest part was that there was every sign of the likelihood of his Pole Day attempt being fast enough. Instead of the surprising pole-sitter he remained a rookie and fate had dealt him the first cruel deal. In later years, Jigger was destined to never being fast enough to qualify for the race, his 1969 mishap remaining his best known claim to fame and glory at the Speedway. Jigger's mishap even sparked a rule change at Indy. After 1969, a rule came out that guaranteed that in case of rain prematurely ending Pole Day every car that had drawn a position in the qualifying line for Pole Day was given at least one chance to qualify for the pole as soon as possible, no matter on which occasion that turned out to be. Off-topic personal note: If all this about 'Jigger' Sirois comes across as negative I hereby apologize. I have had the fortune to have met him in person in 2016 and spent a nice period of time with this wonderful and colourful man who has a surprisingly cheerful look on his racing (and Indy) career and is happy to talk about it too. Before I forget, do you need any more specific updates with regards to the Cicada's results that year at Indy? Sirois did manage to qualify for the race in the final hours of the second and last qualifying day. It was a wild day with lots of time lost to rain and in the late hours of the day it became a mad dash for anyone who then at least got one more chance to qualify. The same applied to Sirois, and there were so many drivers behind him queuing to qualify themselves that should he have been waved off he would never get another, since qualifying was due to end at 18:00. Sirois finished his attempt but he was by far the slowest of all cars that had qualified and was eventually bumped from the field. After Indy, the Cicada was driven by Dan Murphy and his best result that year was a 7th place in the 125-lap, 250-mile race at Michigan on September 15, 1974. Michigan was always tough on cars and so was this race. Murphy was flagged off having driven 106 of the 125 scheduled laps. One week later at Trenton, Murphy was classified 13th in a 100-lap, 150-mile race and flagged off after 86 laps. Murphy is said to have wrecked the car at Phoenix, the final USAC Champcar race that season, but I haven't found his name on the results lists. So it appears as if he had a practice accident. The Cicada definitely hadn't set the Indy world alight at the end of 1974. OldRacingCars.com mentions that in December 1974 there were reports that Dan Murphy was building a new car for the Indy 500. This car was to be powered by - of all things - a Ferrari V12 engine. I myself didn't come across any article that was printed in 1974 although by accident I did obtain a news clipping of which I can't figure out the origins. The copy I have has a handwritten date of 8/2/75 and tells a similar story. The article mentions that the intended engine was a 5-year-old V12 taken from a 512 and reduced in capacity from 5 litre to little over 4 litre. As the rules at the time allowed the use of DOHC 4.2-litre atmospheric engines the V12 in question must have been reduced to that capacity. 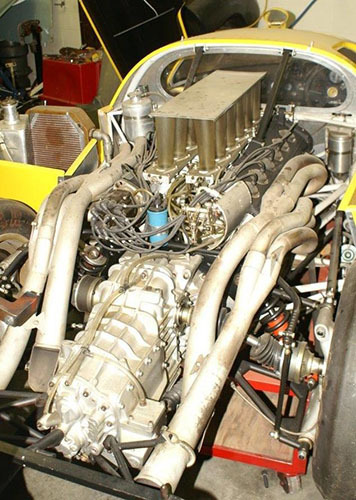 As for its origins, being said to be 5 years old and taken from a 512 this suggests that the engine must be part of the (Group 5) 512 project for which during 1969 and early 1970 Ferrari built 25 cars with 5-litre DOHC V12 engines as used in sportscar racing where it faced the might of Porsche with their 917. The article also contains a picture of what was to be the Cicada-Ferrari. Its monocoque already had some '72 Parnelli inspiration and it appears to have retained that. But the car also sprouted some dihedral fins that were said to be radiators as well as stabilisation fins, not unlike what the '72 Parnelli started its career with. What is even more frightening is that it looks as if the radiator & fin arrangement was higher than the top of the driver's head and blocked much of his sight to his left and right, creating a kind of tunnel vision. The bodywork in front of the front axle was clearly inspired by the McLaren M16. 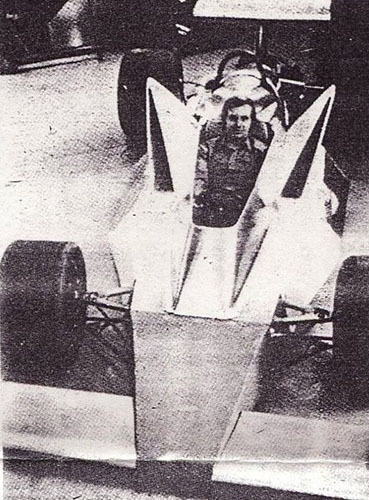 A bad-quality scan from a copy of that 1975 article results in this image of how the Cicada-Ferrari would have looked like. Original source and copyrights unknown (details are welcomed! ), picture will be removed if required by the copyright holder. Murphy's plans appear to have been rather massive since in his Indianapolis 500 Annual of 1975 (one of only two he made) Donald Davidson mentions that in October 1974 Murphy had been on record as being in the process of obtaining several Ferrari sports car engines for his Indycar and hinting that a second car would be equipped with a factory-supported engine, this again being an atmo V12. Murphy did however state the difficulty of being fast enough to qualify for the race but once in the field he expected the cars "to run all day". As the car never appeared there is little to tell about the Ferrari input for the entire project. And despite its 'rather massive' announcement, there is hardly anything to find - neither in print nor online - about a '75 Cicada-Ferrari project, let alone a '75 Ferrari at Indy project. And this despite a fair number of interesting questions. For instance, where did the Ferrari V12 engines come from? Was one or maybe some of the existing 512s depleted from their engines in order to donate them to this project? And if the original engine was of a 5-litre capacity, how was it reduced to 4.2 litres (a reduction of either bore or stroke of maybe both?) and by whom? As Ferrari fans know, the original 512 engine was designed in 1969. It was derived from the 612 engine, the 6.2-litre V12 used in the 1969 Ferrari 612 Can-Am car. This Can-Am engine was listed as having a bore and stroke of 92 and 78mm for a capacity of 6222.16cc. To comply to the 5-litre maximum the new engine got a bore and stroke of 87 and 70mm for an initial power output of 550hp at 8500rpm. The engine had double overhead camshafts, 4 valves per cylinder and a V angle of 60 degrees. It is beyond the scope of this article to take an in-depth look at the cars fitted with these engines. Ferrari fans who may read this article are likely to be familiar with 512 history but for Indycar fans and other people who are not here is an attempt at a short overview. The factory ran cars in the endurance races that year but scored only a single victory in a World Championship event, the Sebring 12 Hours. Some cars ended up in privateers' hands. A non-championship race in South Africa was won by a 512 in an uprated version (512M). There was definitely potential for more results but due to all kinds of reasons that was never reached. And even if it were, the team still faced the mighty opposition of the Porsche 917. When the rules for endurance racing were changed yet again, meaning that from 1972 on the Group 5 production cars up to 5 litres were banned, Ferrari all but gave up on fielding the cars in 1971. That was left to privateer teams while the factory focused on the development of their new hope for the future, an open spider based around a detuned version of the new 3-litre flat-12 F1 engine. A Team Penske-modified and run example of the 512 worried the 917s on occasion by qualifying on pole and being capable to give them a run for their money but the car rarely lasted a race. None of the privateers managed to score a victory with the 512. Even more ironically, Mexican driver Pedro Rodriguez, one of the drivers who had made the Porsche 917 near legendary and scored many decent results with a John Wyer-maintained Gulf car was killed in a 512 during a one-off drive at the Norisring. During 1971, the engine's power output had gone in the direction of 600hp. But once the 5-litre cars were banned there was little to no use for the cars and engines any longer. Nevertheless, the Ferrari 512 and Porsche 917 are still often seen as the zenith of sportscar racing and responsible for what became known as one of the most legendary Le Mans races of all time, the 1970 event. Thanks to the Steve McQueen movie Le Mans, partly filmed on location that year where the 917 and 512 stood in the spotlights, the 512s gained a reputation and perhaps became better known and more popular than their successors, the 312PBs, and this despite the 312PB's stunning successes in especially 1972 and to a lesser extent 1973. 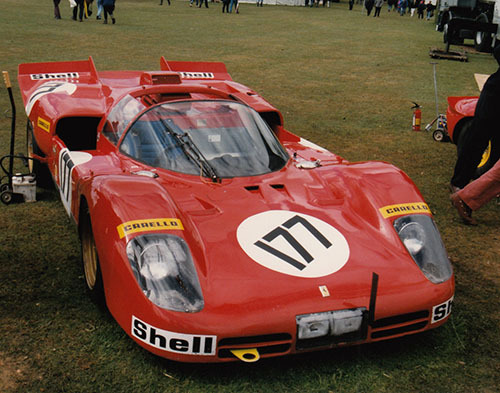 The Le Mans movie had another effect on the history of the 512s. When the cars appears early 1970 they were fitted with short-tail bodies and some cars ran without the roof panel installed, effectively as spyders. At Le Mans, however, almost every car was fitted with a longer, more elegant streamlined tail, the 'Coda Lunga', and thanks to the movie this longtail versions has perhaps become the best known and most familiar of all 512 variants. By 1974 the career of the 512 in whatever form or shape was over and done. And then, entirely out of the blue, came an Indy project based around 512 hardware. An Indycar powered by a 4.2-litre version of the Ferrari V12, and the chassis used as a base for the car was not known as being a top contender at Indy. How about the chances for a project like this to succeed? Murphy's own words about the project were that it was a matter of the car being fast enough to qualify. How right he was coming to that conclusion. For starters, the project started with an engine of about 600hp but then had its capacity cut by 16%. How much of its power output was to be lost with that? With a change from gasoline to methanol something of that loss would be reclaimed but when mentioning the change of fuel what kind of engine modifications (pistons, cylinder head etc.) would be required to make the engine cope with the more aggressive methanol fuel? And how about the changes required on the fuel supply system? And then Murphy had stated to believe that as long as the car would make the cut, the engine would run all day as he phrased it. But was such a claim to be taken seriously? The 512 engine was of course designed and built as an endurance engine so some stamina could be expected from the basic engine. If such stamina would be automatically transferred onto the smaller 4.2-litre engine remains a question that cannot be answered instantly. Another point for doubt is that it was a type of stamina required from an engine that in a long-distance race was used in a large rev range while at Indy the operational rev range window was expected to be smaller and with far more periods of revving at the maximum in a way the original 5-litre version never did: Its biggest challenge was Le Mans where the Hunaudières straight had to be dealt with. Now that was a straight stretch of road of some 6km, which equalled 1.5 times the entire lap at Indy. Anyway, it is next to impossible to predict a power figure for the reworked engine. But I dare to state that it likely wouldn't have surpassed 700 hp. And that was nowhere near enough. In the chapter about Uncle Franco and Ferrari's 1971-1973 plans for Indy I mentioned that in 1973 the all-dominant turbocharged Offy was capable of producing some 1000hp and more in qualifying. I also briefly mentioned how the 1973 race was a disaster that needed to be forgotten very quickly and that rule changes were made to assure that for 1974 turbo boost was maximized to 2.6atm (80" Hg) which reduced the Offies' output to some 750hp and some 800hp for the AJ Foyt-operated Ford/Foyt Quadcam V8. In 1975, the teams had gained a bit on these values, so in other words, Dan Murphy would have been up against 700hp+ machinery with an engine that produced less than 700hp and, to make things even more difficult, an engine that most likely would have been heavier than the majority of its opponents. An Offy is no small engine despite having only four cylinders but in sheer size a V12 that originally had a capacity of 5 litres (derived from an engine that was even larger at 6.2 litres) was far more substantial in size and weight. In hindsight, but even at the time already, one might have wondered why Murphy ever saw any potential in this project, still in a time when no single team would even remotely think about entering a normally aspirated DOHC, 4-valves-per-cylinder engined Indycar. 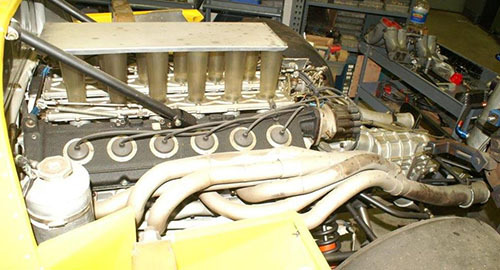 Even the lone atmo-engined car entered in 1974 had a reworked smallblock Chevy pushrod V8, thus two valves per cylinder and pushrod valve activation with a single camshaft. The effort was definitely not top level so that made the achievements not quite representative of what atmo engines were capable of, but it wasn't much. The Cicada-Ferrari project was never carried out as it was intended by Dan Murphy. But what did eventually happen? The Cicada did appear at the Speedway that year, as it had in '72 and '74 but with a regular Offy in its engine bay and without the massive radiator & wing arrangement as was suggested on the Ferrari-engined version. Instead, it carried vertical air intakes on each side of the cockpit that resembled vestigial wings, so was the Cicada imitating the Drosophila Melanogaster? 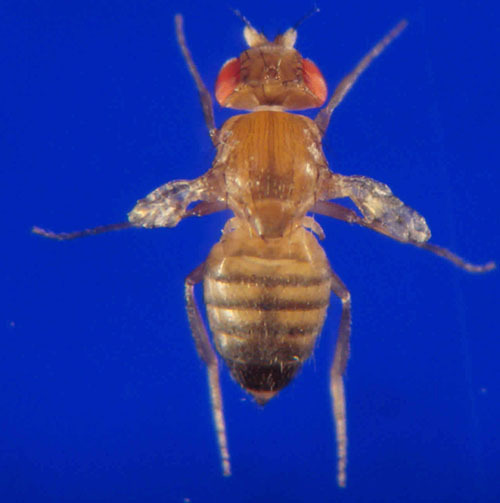 A Drosophila Melanogaster 'vestigial'. How many readers recognize it from the biology lessons that proved and made you understand the genetic laws of Gregor Mendel? The aforementioned “1975 500” annual by Davidson said that after first mentioning Murphy's Cicada appeared on track with Offy power nothing was heard of the Ferrari-engined project in recent weeks. As Davidson mentioned that according to Dan Murphy a factory engine was to be involved as well, one might wonder about the kind of factory input that had been planned. A search for further clues about the tie-up between Cicada and Ferrari failed to provide details. So is that as far as the Cicada-Ferrari went? Let's at least have a look at how one part of the combo that did make it onto the track did that year, as Dan Murphy failed to bring the Offy-powered Cicada up to speeds sufficient enough to pass the mandatory rookie test. The car was then tried by Bob Harkey who was looking for a drive to make the field. But he also failed to succeed in squeezing enough speed out of the car to qualify for the race. Bob Harkey eventually qualified the second Dayton Walther entry with the provision that, if needed, he had to surrender the car on Race Day to first driver Salt Walther. Walther was the first retirement of the race (the third time in four starts he finished 33rd!) with 2 laps done. After Harkey had driven 17 laps with the second Dayton Walther car 'Salt' replaced Harkey. The Harkey & Walther combo was classified 10th in the rain-shortened race. So far for Dan Murphy and to a lesser extent the Cicada. Murphy never again tried to qualify for the Indy 500 and left little trace of his racing career thereafter. His car, however, wasn't done yet. The Cicada did disappear from the scene for some four years before it resurfaced. And, of all things, linked with Ferrari yet again! Now, how this could have happened is a story in itself. Indy fans may be more familiar with this sad story than Ferrari fans so again here's an attempt at a brief version of this piece of history. Many race fans with some knowledge of the history of Indycar racing are aware of the fact that in 1996 a major split occurred in the series, a rift that caused havoc for the single-seater world in the US, and the negative effects of this split are felt to the present day. Not everyone who reads this article may be aware of the fact that when that split took place in 1996, it was basically a new phase in a split that had occured as early as 1978. Until 1978, a single championship existed for Indycars organized by the USAC (United States Auto Club), USAC having taken over from an organisation called AAA that quit the job in the wake of the disasters in worldwide racing that took place in 1955, such as Le Mans and Ascari's death. At Indy two drivers were killed (Manny Ayulo and Bill Vukovich) and some more fatalities occurred in the races that took place after Indy. Never before opinion on motor racing was so negative, and AAA distanced itself from motorsport from that moment on. The newly organized USAC that took over Indycar sanctioning from 1956 on gained a reputation of having difficulties to change along with the tides, occasionally failing to implement rules that were desperately needed while having a strong desire to keep things as they were and retain much of the nostalgia. Curiously, a few rules that were indeed introduced to enhance safety weren't always received very well, as they were seen taking away too much of the danger aspect in racing that enabled the drivers to show off their heroism. During the sixtiess the championship contained events on paved ovals while the traditional dirt tracks remained on the calendar as well. Gradually more paved tracks were included while dirt ovals gradually faded away. And so, against the wishes of a number of traditional fans, the series was split into two different championships, one for dirt tracks and one for paved tracks. USAC officials had difficulties to go along with the changes in the paved championship. It got ever more professional, making it more difficult for the little guys to do well at Indy. Among other issues USAC dealt with they tried to protect the interests of the little guys, resulting in the more professional teams feeling that their interests weren't dealt with properly, as they saw a lot of potential to gain more interest, attention and income being wasted. A few of the most important team owners united and made a plea with USAC to do something about it or otherwise they would start their own series. Late 1978, it became clear that USAC and the Indianapolis Motor Speedway refused to go along with the requests of the team owners. They then formed CART (Championship Auto Racing Teams) and set up their own championship. USAC meanwhile kept organising their own series too. The CART championship had the upper hand with the stronger teams and top level drivers. But both series had to deal with smaller starting fields and as a result a number of hopefuls saw their chance in participating in either championship with older cars that normally wouldn't stand a chance to qualify. Now, however, they were regarded as welcome field-boosting additions that might spring off the occasional surprise. And that is how the Cicada was able to come back yet another time. I haven't found a clue to how and when it happened but eventually the Cicada was sold off and ended up in the hands of Walter Medlin. 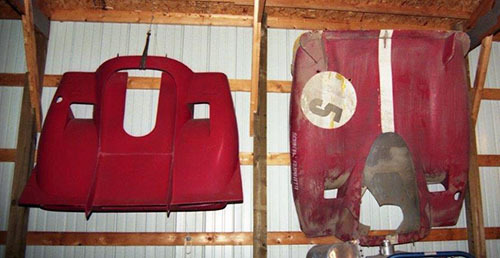 Medlin was to become a known name in the world of Ferrari collectors. Was he by chance already involved with Murphy in earlier years? And did he have a hand in Murphy's 1975 plans already? Anyway, Medlin owned the Cicada-Offy in early 1979 and entered the car for the 1979 Indy 500. It was sponsored by Medlin's SST Museum. 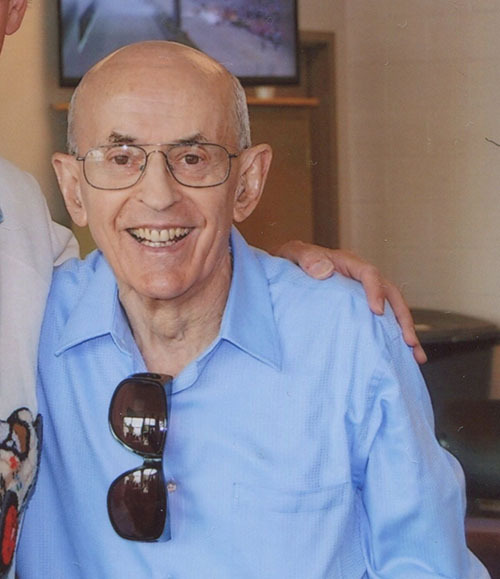 Its number was 35 and the driver assigned to the car was Bill Puterbaugh. And here we have the second time that the Cicada got involved with one of the lesser known names at Indy but among the rookies that continue to appear at the Speedway he belongs to the most legendary of them, although not for the achievements that he looked for. 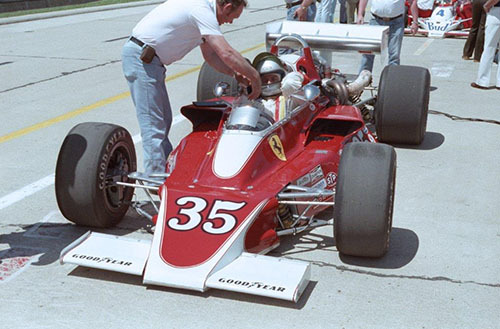 The aforementioned 'Jigger' Sirois (who drove the Cicada in '74) is one of the most legendary drivers at Indy who despite a number of attempts never made it into an Indy 500 starting field. Bill Puterbaugh eventually did make it into the race and actually did so on three occasions. But when he qualified for his first race in '75 he got into the Indy record books as the driver who failed to qualify the most before finally making it. His first attempt had been in '68. He missed '69 but then failed on five more occasions from '70 to '74. He then made the field in three successive occasions from '75 tot '77, even winning the prestigious 'Rookie of the Year' award in 1975 with 7th place. He did not appear in 1978. After reading all this, don't you get a feeling that if the Cicada Indycar failed to deliver results it was at least associated with drivers who had a story to tell about their careers at Indy? Now, how did Puterbaugh get along with the Cicada and what kind of results did he gain with it? A lot has been written about the '79 Indy 500 and practice & qualifying for the event. Here, I want to suffice with the statement that it was a big mess, due to the USAC vs CART war that had broken out. There was more controversy due to several rule changes primarily dealing with the turbo boost and teams trying to find an undetected 'solution' for that. But in the two most accessible sources about the '79 “500” little can be found about Puterbaugh's exploits. Puterbaugh and the Cicada made their first appearance on track on Monday, May 14th, the first day after the first weekend of qualifying. That weekend had seen 25 qualifiers, the slowest of them being Larry Cannon with a speed of 180.932 mph. The Cicada definitely caused a few raised eyebrows. First of all, there appeared to have been little to no modifications (read: developments) since its last appearance in 1975. Even the car's paint job was still very much like that of 1975! Curiously, and for no apparent reason, the car carried a Scuderia Ferrari shield on the cockpit cowling, in about the same location as the Scuderia Ferrari applied the shield on their 1975-'78 F1 cars! On Thursday, May 17th, Puterbaugh was reported to have reached a speed of 178.2 mph which was below that of the slowest qualifier of the weekend before. That 180+ mph speed was not believed to be good enough to make it into the fastest 33. Puterbaugh presented himself in the qualifying line on Saturday, May 19th, actually got on the track at 1:25pm for his first qualifying attempt and made three warm-up laps but didn't take the green flag to start the attempt. And that was the last that Puterbaugh tried with the car. A 1972-vintage chassis qualifying for a race seven years later, it had happened before at Indy. But during the seventies, and with the recent technological innovations in motor racing in general and at Indy itself, the attempt appeared to have had little to no chance. Not that the Cicada was the oldest car entered that year. There were two Eagle chassis of late sixties origins updated with nose and rear wings. One of them, fitted with a Chevy V8 stock block and driven by Roger Rager, actually performed surprisingly well (176 mph!) for such an old car. For our story of Ferrari at Indy: with no Ferrari influence whatsoever in the actual car, the Cicada-Offy was the last car ever at the IMS Speedway during a Month of May that carried a Scuderia Ferrari shield. Was it justified and any kind of honour for the shield to begin with? I leave that to your own judgement. But it is ironic that the shield of Enzo Ferrari's beloved Scuderia was used on a car with which he had nothing to do with at all and, of all things, was powered by a modern-day version of an engine he had been utterly negative about some 27 years earlier. And we may wonder: has Enzo Ferrari ever been aware of an Indycar with which he had nothing to do at alll and carried the shield of his legendary Scuderia? If so, what he would have thoughtabout that? Still during 1979, USAC organized two events at the Milwaukee Mile, and the first race was held on June 10th. Puterbaugh and the Cicada were entered for these and according to several stories the car still carried the Ferrari shield on the cockpit cowling on these occasions. For the June 10th event, Puterbaugh was the slowest of 19 qualifiers for the event but due to ignition failure never started the race. Puterbaugh drove the car again in the second Milwaukee event, again as the 19th and slowest qualifier but on this occasion a car that failed to put down a qualifying time was added to the field. This time, Puterbaugh drove 69 laps before suspension failure ended his race. He was classified 13th in what was eventually the last ever race with the Cicada. For good measure: here is what is known about how it ended with the Cicada. Even after that last race in '79, the Cicada didn't die. The chassis minus engine appears to have survived at least until as late as April 2007 when it was spotted in rather curious circumstances. Incredibly enough, even if then there were a number of links, connections and influences with and from 'the world of Ferrari', the Cicada still appeared to be owned by Walter Medlin. By that time he was a well-known car collector who was also a known figure among Ferrari collectors worldwide. After this unexpected appearance the car didn't leave that many traces on the Internet anymore. But it is not unthinkable that somehow the car is hiding somewhere. The Cicada was named after an fairly large insect that is known for being capable of a lot of noise. The Cicada Indycar could have made noise like no other Indycar ever did. But it never 'hatched' properly because it had little to no chance to do so. And curiously enough, details about it were definitely not buzzing around in the world of Indy historians. For the record, had the Cicada-Ferrari indeed been built, it would not have been the first car other than a Ferrari 512 (no matter the variant) that was fitted with a derivative of the 512 engine. Unlike Porsche with its 917, finding customers and/or use for 512Ss was difficult for Ferrari. One of the original 25 cars was given to Pininfarina and served as the base for the 'Modulo' show car early enough for this concept car to appear at the Geneva Motor Show in 1970, thus in the first year of active duty of the 512S model. This concept car was fitted with another example of the 512-type V12. According to the info available the car started out as one of the 25 512S built. 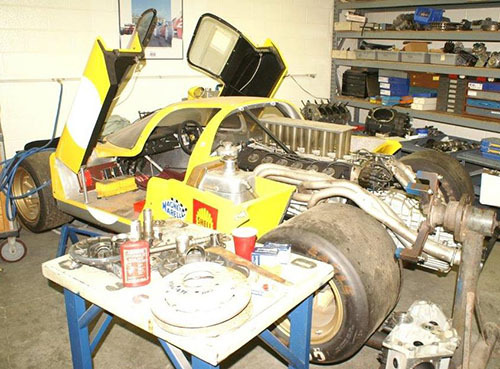 It was then rebuilt into a 612 Can-Am car before being stripped down and rebuilt yet again into the Modulo. The car was presented at the 1970 Geneva Motor Show. The car remained in the possession of its designers and manufacturers (Pininfarina) until 2014. It was then sold to American car collector James Glickenhaus who undertook actions to make the Modulo a usable and road-going car. 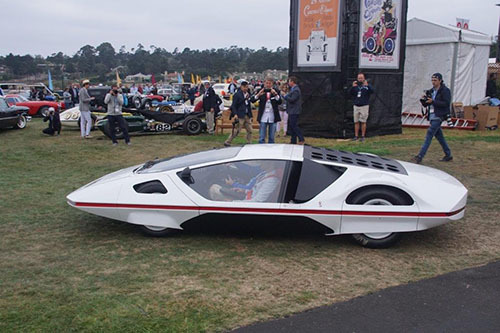 The Modulo appeared at the 2018 Pebble Beach Concours d’Elegance entered in the category M1: Ferrari Grand Touring. 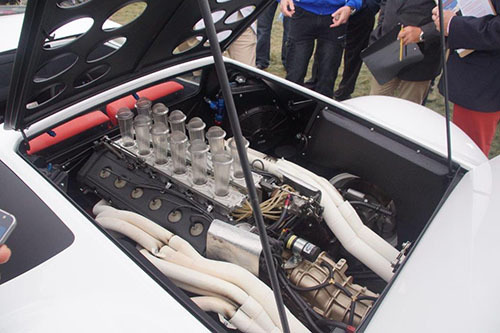 It entered the field on its own power with howling V12 and all. It didn't win a prize in that category but attracted lots and lots of spectators. I know, I realise that when I mention the Modulo I must also mention that other show car that carries the 512 designation in its full name: the 1969 Ferrari 512S Berlinetta presented at the 1969 Turin motor show. That car was, unlike the Modulo, at least named 512! However, from what I found out about that car it was built around a 312P chassis and fitted with a 'shell' version of the 612 Can-Am engine, thus it had even less to do with the 512 as the Modulo. Ferrari Special for Indy? Magazine article, source unknown, date 8/2/75?